Case Study: Singer Carpet Corp. 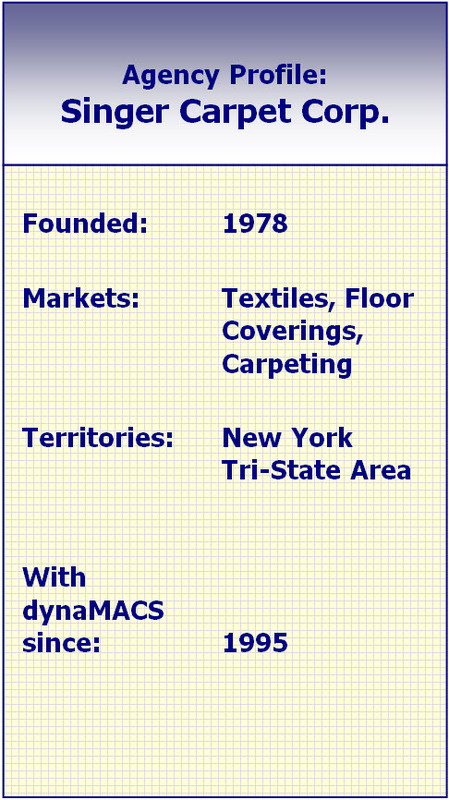 When Singer Carpet Corp. was founded in the late ‘70s, the concept of sales agency software was foreign to most sales agencies. They made due with paper records and rudimentary reports. Singer knew there must be a better way. When Mark Singer, President of Singer Carpet, learned of a software solution built specifically for manufacturers’ sales agencies, he knew he wanted in and became an early adopter. Today as a user of dynaMACS, he has a tool for analyzing agency sales, tracking commissions and paying reps. Whereas in the past the only data available was stacks of paper commission statements, today the agency has easily accessible, organized information that can be sorted and filtered for detailed information. With valuable insight into how the agency is performing, Singer says he is able to see the business in ways that without sophisticated software simply weren’t possible. “dynaMACS makes my life easier. I always know how the business is performing year-over-year,” Singer explains. Singer sometimes brings reports with him when he visits customers, so he can share real numbers that enable him to have strategic and productive discussions with customers. http://www.dynamacs.com/wp-content/uploads/EmpoweringdynaMACS_Logo-Vertical.png 0 0 dynaMACS Software http://www.dynamacs.com/wp-content/uploads/EmpoweringdynaMACS_Logo-Vertical.png dynaMACS Software2015-05-01 09:37:002017-07-11 16:26:26Case Study: Singer Carpet Corp.
GlobalView is a new analytical concept developed by dynaMACS and is unique to dynaMACS Software. Users now have the ability to view all Customer/Manufacturer relationships on a single screen. Prior to this unique feature, users had to drill down from either Customers or Manufacturers to see these records. 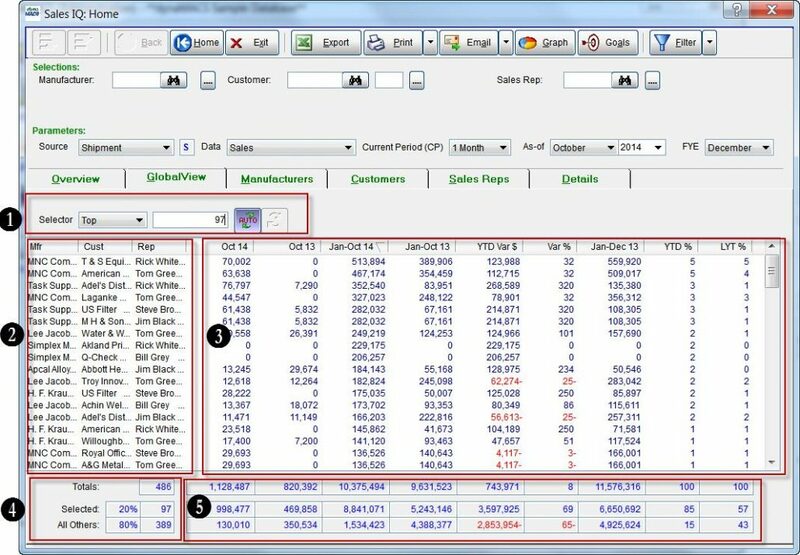 Now users can easily and quickly slice and dice these Customer/Manufacturer relationship records on a single screen enabling them to analyze where they are up or down. When selecting the GlobalView tab dynaMACS will automatically display the “Top” 20% of the customer/manufacturer records based on the user default sort column. The Selector Section is used to determine what records to display in the GlobalView list. The selector options are described below. Top = This is the default option when first displaying the GlobalView tab and by default the top 20% of all records will be displayed. This number may be overridden. For example, if you want the top 10 customer/manufacturer relationships to be displayed, enter “10” in the field next to the Selector field. All = As the name implies, all records will be displayed when this option is selected. New = When selecting New you have the option to see new This Month or new This YTD. AutoRefresh is on when the auto button appears purple in color. Sorting on a column will reload the records based on the selection criteria for that column. AutoRefresh is off when the auto button appears grey in color. Sorting on a column will sort the existing records on the values in that column. Refresh button will reload based on the selection criteria for the sorted column. The performance data is stored in dynaMACS by Manufacturer/Customer/Sales Rep. 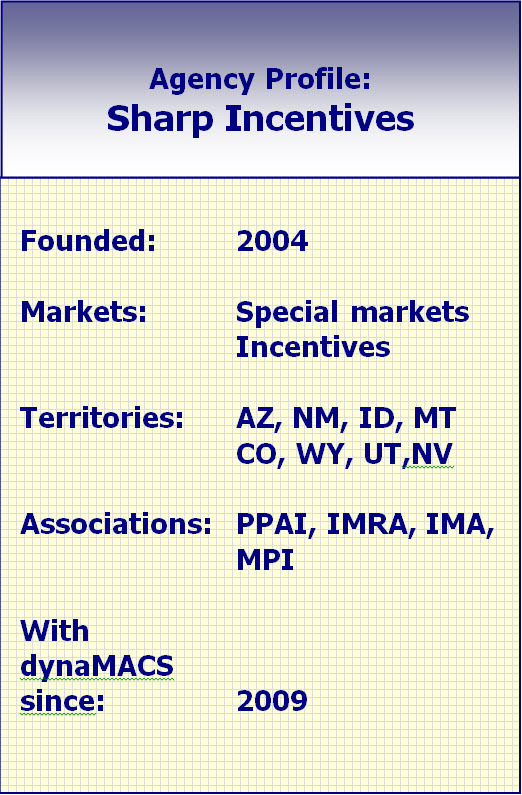 In GlobalView, the names for these entities are displayed on each row of the list. The performance values shown in GlobalView are consistent with the other views in Sales IQ. Totals = This number represents the total number of records in the database. If a filter is used, this number will reflect the number of records in the filtered database. Selected = Based on the selection criteria used at the top of the list, this will show the number of selected records. To the left of the record count is the percent value for the selected records as a percent of the total records. All Others = Based on the selection criteria used at the top of the list, this will show the number of records “not selected”. To the left of the record count is the percent value for the not selected records as a percent of the total records. Totals = The performance values totals shown in GlobalView are consistent with the other view in Sales IQ. Selected = These totals represent the performance value totals based on the selection criteria used at the top of the list. All Others=These totals represent the performance value totals based on the selection criteria used at the top of the list for records “not selected”. Sharp Incentives’ previous sales agency software was difficult to use and required great effort to understand how to navigate to the data the agency was looking for. Sharp Incentives President Tasha Sharp says, “It wasn’t intuitive. I had to spend time figuring out how to get to the information I needed, which was time-consuming.” Sharp wanted easy, fast and accurate software. When she saw dynaMACS’ user friendly interface and the ease with which she could quickly see customer, manufacturer and rep data, Sharp happily made the switch. With dynaMACS, Sharp Incentives gains valuable insight into the business. “It’s robust,” she says. “You can instantly view data the way you want it.” Sharp is reaping the benefits of having complete sales and commission information at her disposal. “I’ve learned so much about my business. Sometimes, what dynaMACS uncovers is surprising. “You might think a particular customer is your most lucrative based on sales. But actually, their commission rate is lower than another customer who buys less but at a higher average commission rate, and they turn out to be your best customer. It’s an eye-opener.” Sharp gets reports on agency commissions, broken down by sales rep, manufacturer and customer commissions..
To make accessing data even easier, Sharp uses dynaMACS on the cloud. Information is always the most recent available and it is accessible anytime, from anywhere on any device: tablet, smartphone or laptop. She’s not tied to the office when she needs information. E.H. & Associates had built a custom sales tracking software using Microsoft Access. But the agency had to continually re-write the program to update or add features. The software wasn’t keeping pace with E.H. & Associates’ business, says Vice President Barry Karlson. “We needed software designed for sales agencies with features and functionalities that would help us operate more efficiently,” Greg Baumker, President, says. In addition, Karlson says E. H. & Associates also wanted to be unburdened from the time-consuming responsibility of managing the software. By switching to dynaMACS, the agency uses software made specifically for manufacturers’ sales agencies. E.H. & Associates now has the tools to see comprehensive data in ways that are useful, meaningful and tailored to agencies’ distinct needs. The agency is able to focus on its core competency: sales. “We have complete information about our customers, manufacturers and sales reps in a system that is easy to use, allows for growth and provides the information that we need to help us grow the business,” says Office Manager Lori Pelzel. 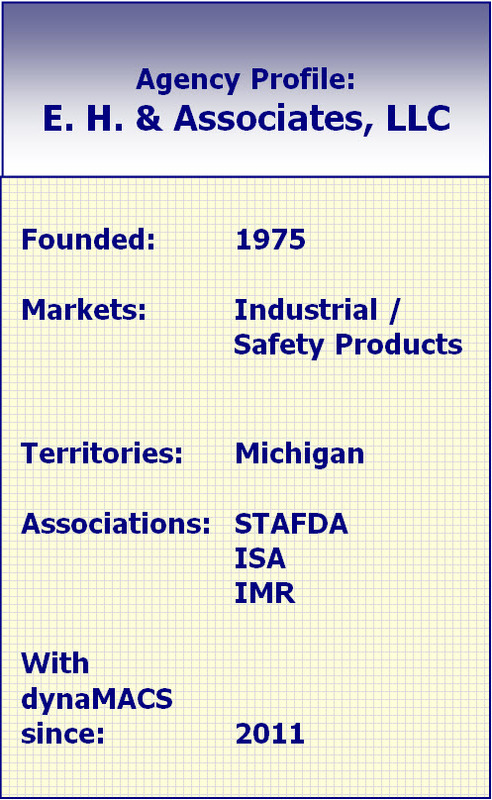 E.H. & Associates also finds that sharing information with customers and manufacturers is extremely useful. “When I visit accounts, I pull up reports on my iPad,” Karlson says. “They provide detailed sales and commission data.” It’s a great way to gain insight and lead the conversation regarding sales, business challenges and opportunities to sell other lines. 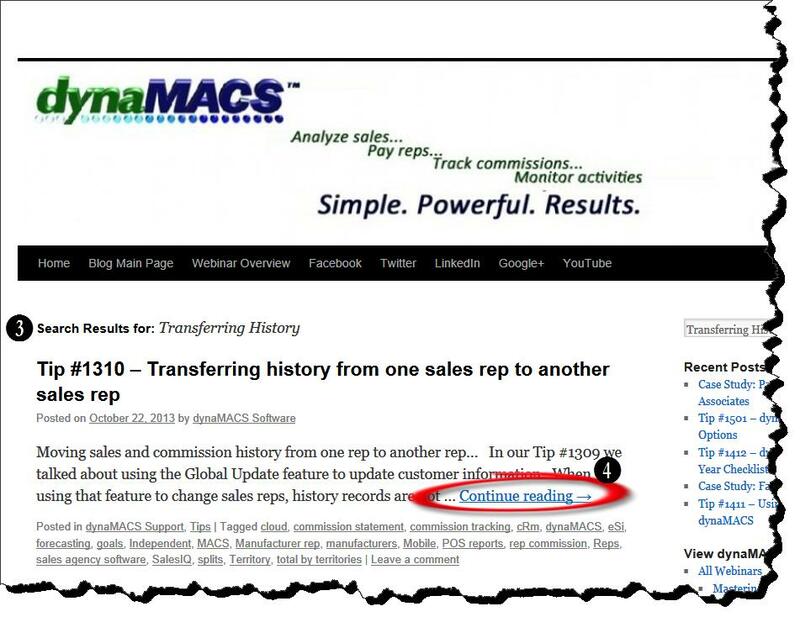 dynaMACS can help you make sales calls more efficiently by using the Sort Feature in the Sales Rep Viewer screen. 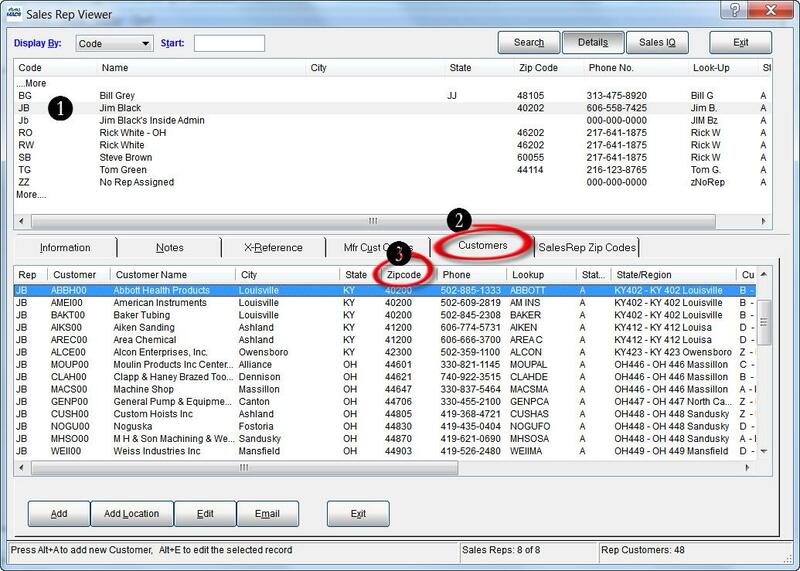 You can access your customer and contact data sorting it by city, state, zip code, phone # or any column heading in the Sales Rep Viewer screen which will group your customers based on the heading that you sort on. In the following example we will sort Customers by Zip Code for all of Jim Black’s (JB) customers. 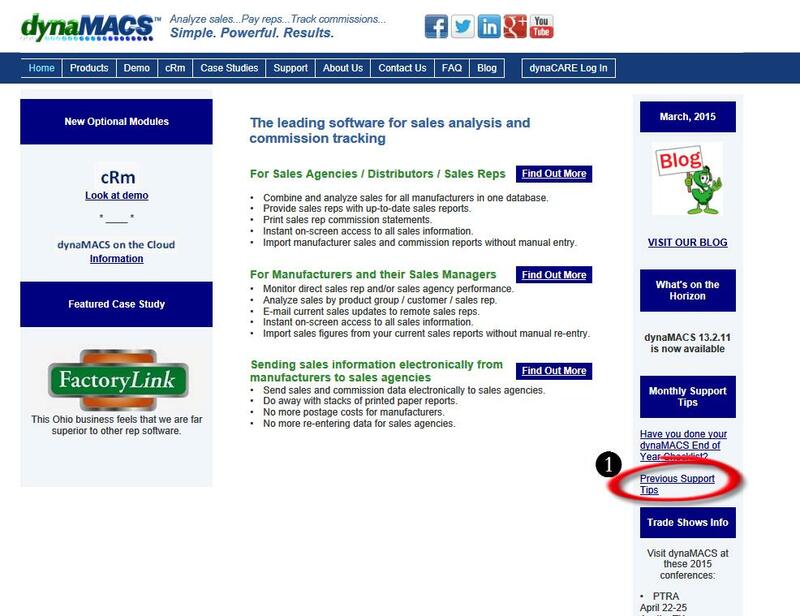 From the Sales Rep Viewer screen highlight the sales rep code. Click on the column heading Zipcode. You will notice that all of the customers are now displayed in order by Zip Code. The dynaMACS website, www.dynaMACS.com, has a library of “tips” which will help you with many process, setup, and reporting routines. We have recently added a search feature which will help you get to the appropriate information quickly. From the main web page select the Previous Support Tips link on the right hand side of the web page. 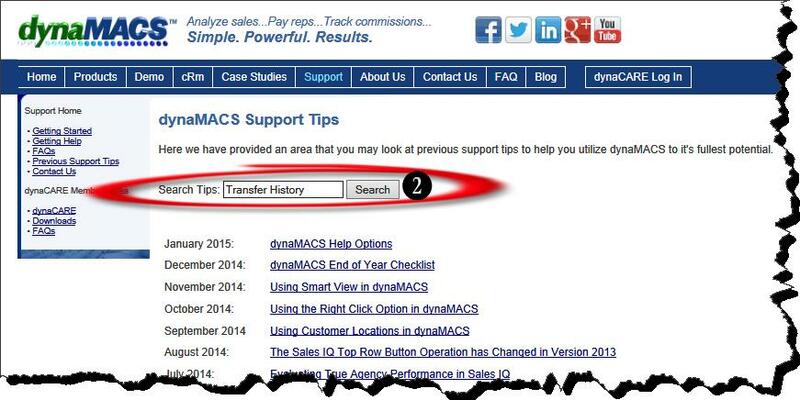 From the dynaMACS Support Tips screen, enter the subject to search on and then select the Search button. In the following example we will use Transfer History as our search subject. The Search Results screen will display any tips related to the search subject as seen below. Select the Continue reading link to display the complete Tip document.